Many followers of the LYF will know that back in 2008, we helped set up the Oromo Coffee Company with a group of Oromo refugees from Ethiopia who had been resettled in the UK. Since then, the OCC has continued to grow and establish itself as one of the UK’s most innovative and progressive coffee companies – a non-profit social enterprise, owned and run by members of the Oromo refugee community. As well as selling high qaulity, Fairtrade and organic coffees from Ethiopia, the OCC is actively engaging in community development work in the UK, helping Oromos and local communities to learn about setting up and running a community enterprise, seeing the value of social enteprise and working for the benefit of the wider community both in the UK and back in Ethiopia. 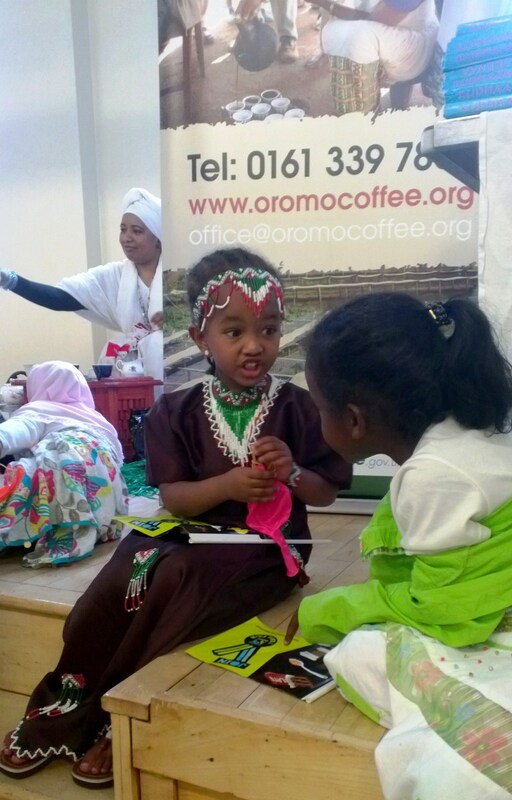 This week we joined the OCC at a gathering of the England Oromo Community, set up to help Oromo people resettled in the UK to celebrate and promote their culture and identity. Some inspiring community leaders spoke about how important it was for the Oromo community in the UK to intergrate, to establish itself within the wider community, but to also ensure that, young Oromo people in particular, are able to learn their mother tongue language, understand their cultural heritage and what led them to flee their homeland. It is great to see the Oromo Coffee Company becoming well-established both in the market-place and amongst the Oromo community across the UK. Onwards and upwards….. This entry was written by Ian Agnew, posted on 20/08/2013 at 8:25 pm, filed under Latest News, Oromo Coffee Company and tagged Africa, African farmers, Blackgold, coffee, coffee trade, enterprise, Ethiopia, fair trade, fairtrade, Lorna Young Foundation, LYF, OCFCU, Oromia Coffee Farmer Cooperative, Oromo Coffee Company, refugee, social enterprise, Trade not Aid. Bookmark the permalink. Follow any comments here with the RSS feed for this post. Post a comment or leave a trackback: Trackback URL.